Crickets as big as two inches shared the Super 8 room with me, I sat up all night because I could not fathom sleeping in a bed full of them or other creepy crawly jumpy things. The old worn out and faded carpet looked like a rug that had been stretched to the walls in pretense. The furniture was a hodge-podge of stuff that had been gathered over the years. The tub mat – to keep one from slipping – was so dirty that when the water hit it a rush of mud-like slush immediately filled the bottom of the tub. Had I been able to lock that darn rental car I had (one of those keyless types), I would not have even taken my things inside. It was the night of the Navy versus Texas State football game and all the rooms were taken in San Marcos including one of the nights of my stay at the Viola Street Inn so I had to find elsewhere to stay for that night. There was a rowdy bunch out in the parking lot most of the night after the game; they partied well into the wee hours of the morning. Had they not been there, I probably would have slept in the un-lockable rental car. Directed by Ruben Gonzalez, (O)n THE 5:31 delivered. Each actor brought their A game. The reading was so magnetic, audience members were blown away. Playwright Mando Alvarado seated (in cap). Director, Ruben C. Gonzalez seated next to the playwright. Artistic Director of the Black and Latino Playwrights Conference, Eugene Lee (standing in striped vest). 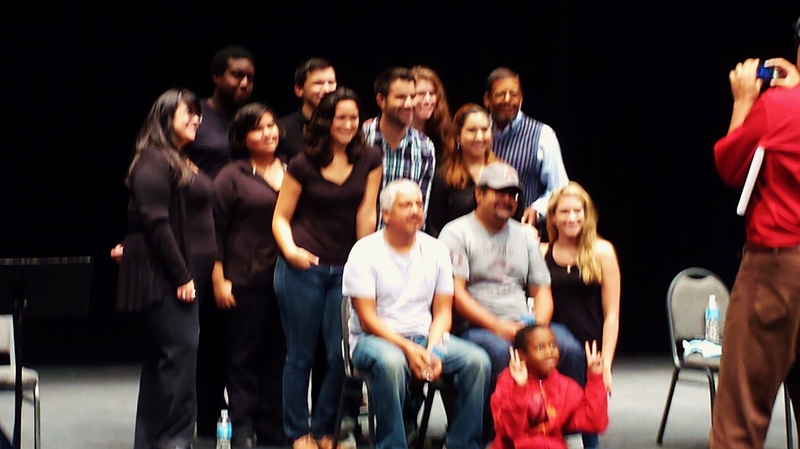 Cast and Crew of O(n) THE 5:31 with Cedillo in red taking a picture. This play is quick witted and has a tempo that jolts you in your seat. I found that the play hit me like a dream – the flow, cadence, and unique way the story was told kept me in it on a level that I only reach when I pull all nighters in my own writing where I am so drained and bare the only thing that’s coming out of me is the purest part of the story. Alvarado’s play deals with the present, past, and thoughts in between, the story is also centered around a female character. In less skillful hands, this structure could be confusing to an audience but Alvarado’s writing is very clear. It keeps you in the moment. Alvarado’s play makes you punch drunk but all your senses are aware of every high and low of the ride he takes you on, a ride like you never thought existed. During the week, as I watched the rehearsals, actor Bernardo Cubria possessed an innate ability to articulate the playwright’s words no matter how up heaved. Cubria has worked with Alvarado on several of his plays; this familiarity was helpful to the playwright I am sure but also to the other actors. I watched the actresses as they searched for their characters, worked on spot directions and then changed it as the pages changed. The end result of these three thespians navigating the script that resulted was top rate. There is a lot to be said for actors who come ready to work; these actors were a perfect fit for O(n) THE 5:31. This was not a “Latino” play; this was a play by a playwright who happens to be Latino. I for one will be watching for his work from now on. My favorite line in the play, is the title line and I won’t say more. You really need to see this play. Actors: Emily Reas, Bernardo Cubria and Kaylie Hyman; Photo by Joe Luis Cedillo, Associate Artistic Director and Dramaturg for (O)n THE 5:31. (O)n THE 5:31 actors: Elyssa Trevino and Joseph Paz reading stage directions, Emily Reas as Gina, Bernardo Cubria as Benny, and Kaylie Hyman as Sandra; Photo by Joe Luis Cedillo, Associate Artistic Director and Dramaturg for (O)n THE 5:31. I’d love to see this, too, Robin. Sounds wonderful. And you’ll have to write a play set in that motel! Love this, from your motel description to the play’s unfolding. When & where will we be able to see it?! I know. I will have to contact him for an update. Thanks, Nancy.